Fixitnow.com Samurai Appliance Repair Man: Appliance Repair Wisdom for the Ages: Appliance Repair Revelation, The Secrets of Household Electricity... REVEALED! Appliance Repair Revelation, The Secrets of Household Electricity... REVEALED! If you're looking for a good reference to help you understand simple home wiring, the Samurai recommends The Basics of Household Wiring DVD. If you think you already know it all, then you don't know what you don't know. Think about that, "You don't know what you don't know." You know, the mark of an educated person isn't that they know everything or even a lot of things; no, the mark of an educated person is that they do know what they don't know. I've been working with electricity for over 30 years and there were things in this DVD that even I didn't know. My Diddy always telled me, he said, "Son, the only real sin is wasting good beer." No, wait, wrong quote; he used tell me, "Son, the day you stop learning is the day you might as well check out 'cuz yer brain done died so what's the point of living?" Yeah, my Diddy taught me lots of stuff. He even taught me how to tell time on his watch, which he never took out of his pocket. But, hey, that's a story for another post. What were we talking about? 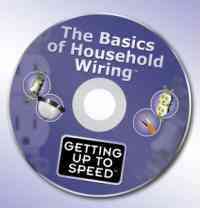 Oh yes: The Basics of Household Wiring is a professionally produced DVD by the production company, Getting Up To Speed. This excellent tutorial is designed to help you clearly understand electricity in your home, and demonstrates how to safely perform simple electrical projects. You can feast your Vulcan squinties on sample clips of this DVD here. This DVD is a must-have if you're planning on tackling any home electrical project. Also, if you're attempting any electrical repair on your appliances, it is essential that you arm yourself with a solid understanding of electricity in your home and the basics of wiring. The Basics of Household Wiring does exactly that. Ok, so right about now you're saying, "I'm a believer! Gimme, gimme! How much?" That's sweet of you to offer to buy it, but this DVD ain't for sale. Nope. Since the Samurai is all-touchy, all-feely, and all-smelly, he is giving this DVD away as a free gift to his tired, his poor, his huddled grasshoppers yearning to fix it now with your love-offering of $40 or more to the United Samurai Beer Fund. Recommended Reading: Making Basic Electrical Measurements.